The 1st/2nd grade teachers believe that a great way to explore what it takes to make a community is to build one, so the class spends the year creating a scale model of a city. The project emphasizes critical skills like math (measurement, scale, mapping, and categories), collaboration, report writing and decision making and also helps children understand their place in the world. The teachers begin the year by having the children locate themselves, their homes, their school, and their towns on the map and then expand their thinking to consider cites, states, continents, and the entire planet. The grandness of the Earth and the complicated structures of countries, states, cities, and neighborhoods is quite a bit to ask a young mind to comprehend. Starting with a personal connection gives the children a toe-hold for this complex subject. The group then moves to brainstorming about what is in a city. Children draw from their own experiences and from field trips to local businesses and other sites. Once the class has generated a long list – that often includes things like parks, hospitals, playgrounds, and donut shops – the children work in small groups to sort the items into categories. Next comes the crucial “Town Meeting” to decide the most important things to have in the city. Can there be a candy store and a donut shop if there isn’t anywhere to buy clothes? What would it feel like if all the entertainment costs money instead of having, perhaps, a public park or playground? 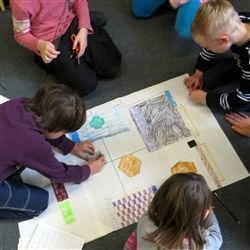 Once the children have decided what they will build, they work together to generate scale drawings on graph paper and then create buildings with foam-core. They add details like windows, doors, and perhaps a turtle pond on the roof! Trees are added to the town as is playground equipment, people, and even animals. The project culminates with a short report by each child about what they built and why it is important for the town.